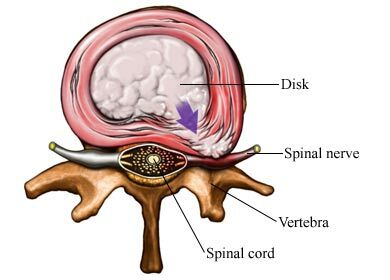 Discs are small circular, compressible cushions between the vertebral bones in the spinal column. They act as cushions for the vertebrae. A herniated disc bulges from its proper place, putting pressure on spinal nerves. This is most common in the lower spine. A herniated disc is caused by reduced water content, which results in flattening and less cushioning. It can also be the result of trauma. Note: —This is an emergency, call for emergency medical services right away. The doctor will ask about your symptoms and medical history. A physical exam will be done. Your spine will be examined. The movement, strength, and reflexes of your arms and legs will be tested. Awad JN, Moskovich R. Lumbar disc herniations: Surgical versus nonsurgical treatment. Clin Orthop Relat Res. 2006;443:183-197. Humphreys CS. Clinical evaluation and treatment options for herniated lumbar disc. Am Fam Physician. 1999;59(3):575-582.